(L-R) Dionysus (Stanley Tucci) takes Percy (Logan Lerman) under his wing IN “Percy Jackson: Sea of Monsters.” ©20th Century Fox. CR:Murray Close. 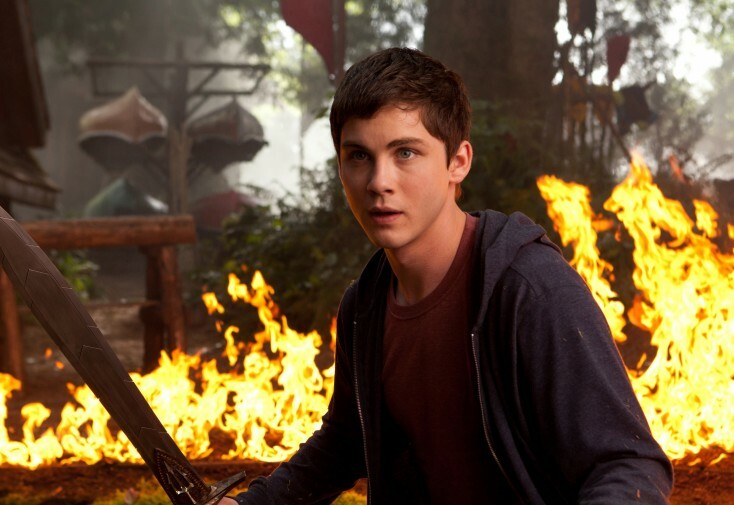 HOLLYWOOD—Logan Lerman reprises his role as a teenage demigod in the action-packed “Percy Jackson: Sea of Monsters,” a sequel to 2010’s “Percy Jackson & The Olympians: The Lightning Thief.” The films are based on Rick Riordan’s popular young adult fantasy books that mix ancient mythology with modern day characters. Percy turns up in Hogwarts-like camp for kids with special powers, but dark forces that want to bring harm on the school discover the hidden training facility. The fantasy adventure is directed this time around by “Diary of a Wimpy Kid” helmer Thor Freudenthal (taking over from Chris Columbus, who serves as a producer). After their camp is attacked, Percy and his pals Grover (Brandon T. Jackson) and Annabeth (Alexandra Daddario) set off on an daring ocean adventure to retrieve the Golden Fleece, a magic blanket hidden somewhere in the infamous Bermuda Triangle, which just so happens to be guarded by dangerous sea monsters. The handsome 21-year-old recently talked about returning to the character and taking a journey to sea. Q: Did you just fall right back into character or did you have to reintroduce your character to yourself? Lerman: Jumping back into the old shoes, it was a lot of fun. Q: Did you have to go through boot camp again for this movie? What were some of the new challenges involved in making this movie? Lerman: No boot camp. There wasn’t a boot camp. I mean, I speak for myself on this one, maybe Alex too. I don’t know. I’m sure Brandon might have done it because he did “Tropic Thunder” beforehand and all that too. But it was like the first time, on the first movie, really preparing for such a big action film with all the wire work and fighting and all that, I’d never done that. So we did a lot of training on the first movie. But then getting into the second one, we felt pretty comfortable. So we didn’t really need too much training, preliminary training, but throughout the whole movie, we’re constantly just preparing for a new fight scene, or wire scene, or some flying, or on water. It was crazy. Q: A new element added to it this time is the water. Did that involve some additional swimming, diving or other water work on your part? Lerman: We didn’t have to get wet, which was nice. So that’s kind of cool. But we were on a boat a lot, a pretty small boat, and it was really hot. So it was like being out in the water, we can’t go back and forth. That’s adding another hour in between shots or something like that. So we were out in the boat for a long time. We were shooting in New Orleans and it was the summertime. So it was just the heat. It was kind of difficult to work with. But other than that, it was really beautiful. It was fun. Q: Are there any Greek mythological characters that you are excited to see on screen? Lerman: Polyphemus (a cyclops played by Robert Maillet). That’s one of my favorite characters too in Greek mythology just coming back to “The Odyssey” and all that. It’s pretty cool the way that Thor and all the visual effects team visually created Polyphemus and all the original ideas and what it turned out to be. Really cool. Q: Why do you think the Percy Jackson world in books and films resonates with people? Lerman: The similarities between a film like this and obviously very similar films as well, structurally, is that there’s something really appealing, and especially to me growing up. It’s about young people in extraordinary situations dealing with human issues, human problems, and flawed characters as well. None of us—our characters aren’t perfect. I guess the extraordinary situation we’re in—there’s something appealing about that. The kid’s got to save the world, you know? That’s crazy. That’s fun. Q: Musicians often say they’re only as good as their last performance. Is Percy suffering a little bit of what to do next after displaying his heroism in the first film? Lerman: Yeah. That’s a good way to put it. At least, he is at the beginning of this movie. At the end of the first one, we ended it with him being the hero and now he’s not the hero anymore. And he has that similar thought in his mind like, “Maybe it was just luck, that one time. That’s my thing. That’s what I’ll be known for. Let me just accept being an average demigod.” It’s human, it’s human. You know what I mean? It’s extraordinary but it’s human. So that’s kind of where we find him at the beginning of this film. He’s kind of doubting himself and he’s been one-upped by Clarisse (Leven Rambin). Q: What have they not written for your character to do yet that you’d like to do in the next installment? 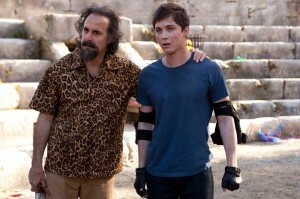 Lerman: I know what I’d like to bring back. I don’t know what I’d like to do with Percy, but I think the flying shoes were fun in the first one. I hope that somehow (they could) incorporate them again if we do a third one. Q: What’s caught your attention when the fans are so deep into the books’ mythology? Lerman: It almost goes without saying that the majority of people that would recognize me in my normal, everyday life from this film are kids. My family works a lot with children and it’s really nice to see that a movie can make them so happy. A photo might make them happy just because that’s the character from the movie that they like, or whatever. I say that’s the most value I get out of being a part of this film.